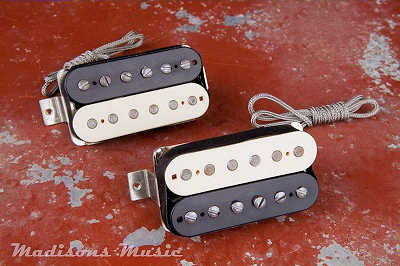 Crystal Clear Pickups 50's PAF's. Our 50's PAF's are reversed engeneered from an original set removed from a 1959 Gibson 335. The pickups offer a crisp uncompressed tone with note definition and tons of individuality. Like the originals the coils have been hand wound in a 42PE USA wire. Coils are mismatched. We use 70's New Old Stock Alnico 2 Bar Magnets. We rate all our magnets with a gauss meter so each set is matched. We use a USA Butyrate bobbin. Not wax potted. We can supply these at any level of distress. If you would like to send photo's for reference please contact us. Covers available upon request. Please contact for quote. If you have any questions please feel free to contact us. Overall this set is for the vintage gear head.